When I was a little girl in Canada, pudding was one of my favourite things. I particularly liked pudding pie, with its graham cracker crust and its soft, velvety milk pudding filling. Being a child of the seventies, I was a great fan of Bill Cosby’s advertisements for Jello Pudding, and it was that my Mom always bought. We used it for dessert as it was, or used it for making other desserts, from the aforementioned pudding pie to (with the addition of some other ingredients) wonderful light cakes. When I first arrived in England twenty years ago, I was surprised to see that Jello as a brand did not seem to exist over here. I was very disappointed to find that instead of the myriad of flavours of Jello gelatine I was used to seeing on offer, all there were was small boxes of Hartley’s gelatine cubes. These were a mystery to me because, as far as I was concerned, gelatine was a powdered substance (except if I was making something very fancy indeed, in which case it came in “leaves” or sheets). Not only that, but there was no Jello pudding. In fact, there was no “pudding” of any kind. My enquiries of the staff in the grocery store yielded only confusion and usually went something like this. “Pudding? What kind of pudding dear?” they would enquire. My reply of “I really don’t mind what flavour” would cause their brows to furrow with confusion. “You know, the creamy kind you mix up?” I’d reply. By this point I was so confused and embarrassed I would usually give up. I soon discovered what the problem was. Not long after that I was in a casual restaurant eating dinner with my boyfriend, G, who would later become my husband. “Any pudding chaps?” the waiter enquired after we had finished our main course. Thinking I might finally have discovered somewhere I could get a creamy, milky dessert that faintly resembled the thing I so enjoyed, I eagerly answered “yes”. The waiter disappeared and returned with a list of desserts, not one of which was pudding. In desperation I turned to G and asked him what was going on. Although he is English, G spent a considerable part of his youth in the States and so was ideally placed to sort out my confusion. He gently explained that in England, and in fact pretty much anywhere in the United Kingdom, pudding is not a creamy, milky dessert. Here, pudding is defined as the final part of a meal. It is usually something that is served hot, like sticky toffee pudding or rice pudding, but over the years the word “pudding” has come to mean the same thing as the word “dessert”. Even an ice cream sundae or piece of cake can be a pudding. Even now, twenty years later, I still cannot buy instant pudding here in England. Actually, that is not strictly true, you can buy a whipped dessert called Angel Delight . It is similar, but once you have had Jello pudding, nothing else really measures up. 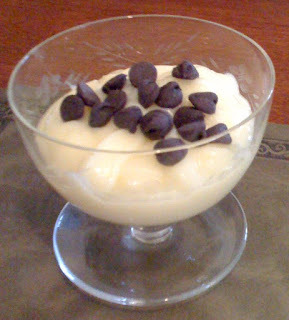 I find Angel Delight to be too sweet, and its texture very grainy, nothing like the smooth creaminess of my favourite. I really miss it in cooking too. It’s impossible to make Bacardi Rum Cake the way I really love it without the addition of a package of vanilla Jello pudding, although heaven knows I have tried. As a result, I have been known to bring back boxes of Jello pudding in my suitcase after visits to Canada or the States. My husband laughs at me, but we do enjoy the desserts I make with it so much. I have to confess I always worry as I walk through Customs though. There is nothing illegal about bringing it in as it contains no forbidden ingredients, but I can only imagine what the officers would say if they opened my bag and saw several boxes of the stuff tucked in amongst my clothes. I might never live it down, but it would be worth it!